SUNRISE, Fla. — One by one, Florida Panthers players flocked toward teammate Jaromir Jagr to ask for a quick photo beside his stall in the locker room. They side-stepped Jagr’s four pair of skates, weighted vests, workout contraptions and post-game elixirs, then smiled. Green rookie or grizzled veteran, they all wanted to chronicle history, to document their brush with a living legend and the milestone puck with which he collected his 1,887th NHL point. Luongo took his own keepsake photograph in the same locker room, yet no one seemed to notice that he tied Terry Sawchuk for fifth all-time in wins (447). No, this night belonged to the Ageless Mullet. 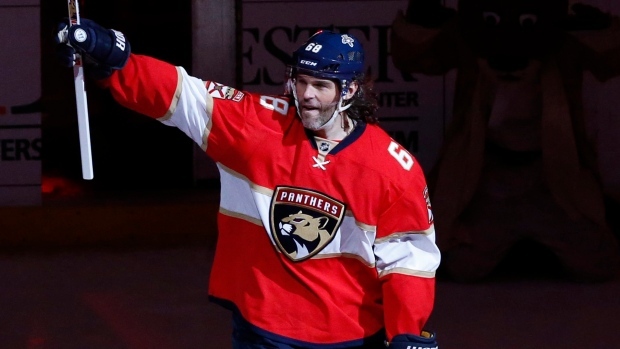 With assists on all three Panthers goals, the 44-year-old Jagr matched Mark Messier for second place on the NHL’s all-time points list, bringing his illustrious total to 1,887 points in a 4-3 shootout win over the Buffalo Sabres at BB&T Center. It was spine-tingling to witness history when Jagr setup Nick Bjugstad’s game-tying goal in the waning minutes of the third period. You could almost feel it coming the way Jagr took control of the game through the first two periods. The game momentarily slowed to a pause as Jagr was then serenaded by fans and his teammates when his accomplishment was announced. He responded with a salute, of course. Aleksander Barkov asked the on-ice official to set aside the puck, while Bjugstad comically kept telling him to stop. He thought Barkov was pulling a prank since it was Bjugstad’s first goal of the season. Yes, something just a tad more important. Jagr needed 94 fewer games to tie Messier. He can pass him with one more point beginning on Thursday night when the Panthers host Boston. Messier knew his mark wouldn’t stand the test of time, not with Jaromir Jagr continually defying Father Time. Adding up the three seasons Jagr spent in Russia, as well as the full year and two halves he missed due to NHL lockouts, Messier said he considered it a foregone conclusion Jagr would someday pass him. It won’t be long now. Messier, now 55, said he isn’t resentful at all to now share company with Jagr. Wayne Gretzky, the NHL’s all-time leading scorer by a staggeringly wide margin, still has 76 more assists than Messier and Jagr now have points. Jagr and Messier trail Gretzky by 970 points - meaning Jagr would essentially need to start a separate Hall of Fame career right now just to try and catch The Great One. Finishing second only to Gretzky, though, is sort of like being first among the rest of the nearly 6,000 other mere mortals to play in the NHL. Messier stood alone in that position for nearly 13 years. He surpassed Gordie Howe with his 1,851st point on Dec. 29, 2003 during his final season with the New York Rangers. Tuesday marked the 535th multi-point night of Jagr’s 1,662-game career - nearly 200 more than the next closest active player. Jagr was a force all over the ice for the Panthers on this night, playing like a man possessed. Messier called Jagr one of the “best corner men to whose ever played the game.” He said he couldn’t think of one player who has ever been better at cycling the puck, someone who makes it “next to impossible” for defencemen to try and contain him. Messier won’t be able to contain Jagr, either, six weeks shy of his 45th birthday.